Ever so often I get a glimpse of the person I could be. Sometimes it’s inspiring many times however it’s frightening. One such moment in time: this morning, getting an email from my father informing me that the men’s 100 metre IAAF World Championships were on. Very few people who know me know this about me. I *love* to watch men’s 100m races for the Olympics and World Championship games. That’s two races every four years and believe me that’s more than enough. Today Kim Collins of St. Kitts placed third. He is 35. How he manages to continue to qualify I have no idea. As stated by a fb friend, Kim Collins probably has children near the age (22) of the winner of the race. I must say it’s quite inspiring though, I’m sure I would have hung up my running shoes a long time ago. In more shocking news Usain Bolt false started and was disqualified. Though I’m an Asafa fan I certainly respect the talent Bolt has and false starts always hurt my heart. All the other runners who now have to re-psych themselves and wonder what could have been were there no false start. 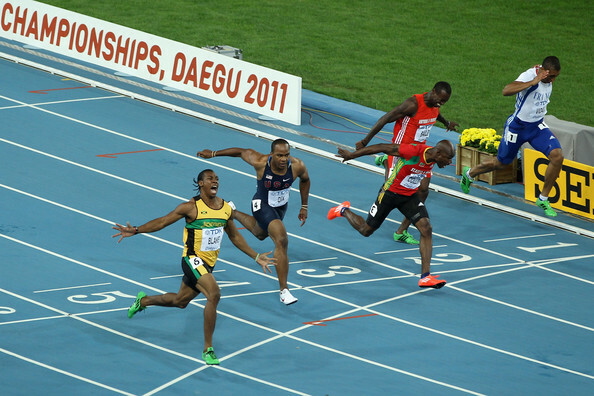 On a less related note Bolt’s upper body is incredible, to steal a line from Crazy Stupid Love he looks photoshop-ed. All of that said, check out the video and Olympics 2012 I’m waiting!